Jim Reeves had his first number one in 1953. In 1953 Billboard magazine published three charts covering the best-performing country music songs in the United States: Most Played in Juke Boxes, National Best Sellers, and Most Played By Jockeys. All three charts are considered part of the lineage of the current Hot Country Songs chart, which was first published in 1958. At the start of the year, Hank Williams was at number one on the best sellers chart with "Jambalaya (On the Bayou)" and he thus held the top spot when he died in the early hours of January 1, 1953. Williams also reached number one in January with the final single released in his lifetime, "I'll Never Get Out of This World Alive", and went on to have two further posthumous number ones on the best sellers listing during 1953 with "Take These Chains from My Heart" and "Kaw-Liga". The latter song had the longest run of any song in the top spot, spending 13 weeks at number one. In total, he spent 19 weeks at number one on the best sellers chart, the most by any act. In addition, "Your Cheatin' Heart", which fell short of the number one position on the best sellers chart, topped both the other listings, meaning that five songs by Williams reached number one in 1953. Regarded as one of the most influential musicians in country music history, Williams was among the inaugural class of entrants to the Country Music Hall of Fame in 1961. Seven acts achieved their first number ones in 1953: The Carlisles, Goldie Hill, Jim Reeves, the duo of Jean Shepard and Ferlin Husky, The Davis Sisters, Mitchell Torok and Hank Locklin. In addition to having his first number one as a performer with "Caribbean", Torok also wrote the song "Mexican Joe", which gave Jim Reeves his first chart-topper. "I Forgot More Than You'll Ever Know" would prove to be the only hit for the Davis Sisters, who were not actually related. Two months before it topped the charts one half of the duo, Betty Jack Davis, had been killed in an automobile accident. Surviving member Skeeter Davis would go on to have a long solo career, scoring top 20 country hits well into the 1970s and achieving some pop success, but she would never achieve a solo number one. At the end of the year "I Forgot More Than You'll Ever Know" was at number one on the juke box chart, Webb Pierce topped the best sellers chart with "There Stands the Glass" and Hank Locklin held the top spot on the jockeys chart with "Let Me Be the One". Skeeter Davis topped the chart in 1953 as one half of the duo The Davis Sisters. She would go on to have a lengthy and successful solo career but never achieved a chart-topping solo single. "I Let the Stars Get In My Eyes"
Hank Williams had four number ones on the best sellers chart in 1953. He died on January 1 of the year. Hank Locklin ended the year at number one on the jockeys chart. ^ a b c Erlewine, Stephen Thomas. 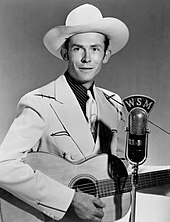 "Hank Williams Biography & History". AllMusic. Retrieved October 1, 2018. ^ Whitburn, Joel (1996). The Billboard Book of Top 40 Country Hits. Watson-Guptill. pp. 62, 91, 146, 187, 263, 287, 325. ISBN 0823076326. ^ "Mitchell Torok Biography & History". AllMusic. Retrieved October 2, 2018. ^ a b Unterberger, Richie. "The Davis Sisters Biography & History". AllMusic. Retrieved September 29, 2018. ^ Whitburn, Joel (1996). The Billboard Book of Top 40 Country Hits. Watson-Guptill. p. 91. ISBN 0823076326. ^ Unterberger, Richie. "Skeeter Davis Biography & History". AllMusic. Retrieved September 29, 2018. ^ a b c "Top Country & Western Records". Billboard. January 3, 1953. Retrieved October 2, 2018. ^ a b c "Top Country & Western Records". Billboard. January 10, 1953. Retrieved October 2, 2018. ^ a b c "Top Country & Western Records". Billboard. January 17, 1953. Retrieved October 2, 2018. ^ a b c "Top Country & Western Records". Billboard. January 24, 1953. Retrieved October 2, 2018. ^ a b c "Top Country & Western Records". Billboard. January 31, 1953. Retrieved October 2, 2018. ^ a b c "Top Country & Western Records". Billboard. February 7, 1953. Retrieved October 3, 2018. ^ a b c "Top Country & Western Records". Billboard. February 14, 1953. Retrieved October 3, 2018. ^ a b c "Top Country & Western Records". Billboard. February 21, 1953. Retrieved October 3, 2018. ^ a b c "Top Country & Western Records". Billboard. February 28, 1953. Retrieved October 3, 2018. ^ a b c "Top Country & Western Records". Billboard. March 7, 1953. Retrieved October 3, 2018. ^ a b c "Top Country & Western Records". Billboard. March 14, 1953. Retrieved October 3, 2018. ^ a b c "Top Country & Western Records". Billboard. March 21, 1953. Retrieved October 3, 2018. ^ a b c "Top Country & Western Records". Billboard. March 28, 1953. Retrieved October 3, 2018. ^ a b c "Top Country & Western Records". Billboard. April 4, 1953. Retrieved October 3, 2018. ^ a b c "Top Country & Western Records". Billboard. April 11, 1953. Retrieved October 4, 2018. ^ a b c "Top Country & Western Records". Billboard. April 18, 1953. Retrieved October 4, 2018. ^ a b c "Top Country & Western Records". Billboard. April 25, 1953. Retrieved October 4, 2018. ^ a b c "Top Country & Western Records". Billboard. May 2, 1953. Retrieved October 4, 2018. ^ a b c "Top Country & Western Records". Billboard. May 9, 1953. Retrieved October 4, 2018. ^ a b c "Top Country & Western Records". Billboard. May 16, 1953. Retrieved October 4, 2018. ^ a b c "Top Country & Western Records". Billboard. May 23, 1953. Retrieved October 8, 2018. ^ a b c "Top Country & Western Records". Billboard. May 30, 1953. Retrieved October 8, 2018. ^ a b c "Top Country & Western Records". Billboard. June 6, 1953. Retrieved October 8, 2018. ^ a b c "Top Country & Western Records". Billboard. June 13, 1953. Retrieved October 7, 2018. ^ a b c "Top Country & Western Records". Billboard. June 20, 1953. Retrieved October 7, 2018. ^ a b c "Top Country & Western Records". Billboard. June 27, 1953. Retrieved October 7, 2018. ^ a b c "Top Country & Western Records". Billboard. July 4, 1953. Retrieved October 7, 2018. ^ a b c "Top Country & Western Records". Billboard. July 11, 1953. Retrieved October 8, 2018. ^ a b c "Top Country & Western Records". Billboard. July 18, 1953. Retrieved October 8, 2018. ^ a b c "Top Country & Western Records". Billboard. August 1, 1953. Retrieved October 5, 2018. ^ a b c "Top Country & Western Records". Billboard. August 8, 1953. Retrieved October 5, 2018. ^ a b c "Top Country & Western Records". Billboard. August 15, 1953. Retrieved October 5, 2018. ^ a b c "Top Country & Western Records". Billboard. August 22, 1953. Retrieved October 8, 2018. ^ a b c "Top Country & Western Records". Billboard. August 29, 1953. Retrieved October 8, 2018. ^ a b c "Top Country & Western Records". Billboard. September 5, 1953. Retrieved October 7, 2018. ^ a b c "Top Country & Western Records". Billboard. September 12, 1953. Retrieved October 8, 2018. ^ a b c "Top Country & Western Records". Billboard. September 19, 1953. Retrieved October 8, 2018. ^ a b c "Top Country & Western Records". Billboard. September 26, 1953. Retrieved October 7, 2018. ^ a b c "Top Country & Western Records". Billboard. October 3, 1953. Retrieved October 7, 2018. ^ a b c "Top Country & Western Records". Billboard. October 10, 1953. Retrieved October 7, 2018. ^ a b c "Top Country & Western Records". Billboard. October 17, 1953. Retrieved October 7, 2018. ^ a b c "Top Country & Western Records". Billboard. October 24, 1953. Retrieved October 7, 2018. ^ a b c "Top Country & Western Records". Billboard. October 31, 1953. Retrieved October 7, 2018. ^ a b c "Top Country & Western Records". Billboard. November 7, 1953. Retrieved October 8, 2018. ^ a b c "Top Country & Western Records". Billboard. November 14, 1953. Retrieved October 8, 2018. ^ a b c "Top Country & Western Records". Billboard. November 21, 1953. Retrieved October 8, 2018. ^ a b c "Top Country & Western Records". Billboard. December 5, 1953. Retrieved October 7, 2018. ^ a b c "Top Country & Western Records". Billboard. December 12, 1953. Retrieved October 8, 2018. ^ a b c "Top Country & Western Records". Billboard. December 19, 1953. Retrieved October 8, 2018. ^ a b c "Top Country & Western Records". Billboard. December 26, 1953. Retrieved October 4, 2018. This page was last edited on 8 October 2018, at 20:26 (UTC).